The reflection of sunlight on water ripples at the bottom a deep crystal blue pool. This pattern lets you drift into a dream-state and access your innermost voice. 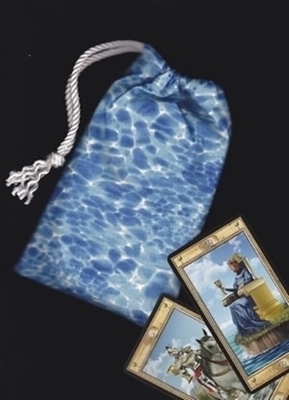 Enhance the intuitiveness of your readings by giving your tarot cards a cleansing, watery home in this Elemental Water Tarot Bag. Water Symbolism: Water has long been connected with feminine mysteries, intuition, and the emotional aspects of life. 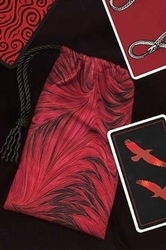 The suit of cups relates to emotional matters, as well as the Moon card in the Major Arcana. In astrology, the water signs are Pisces, Cancer, and Scorpio. 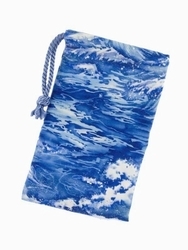 Deck Suggestions: Because water is the element of intuition, and blue is a common color for tarot cards, this tarot bag is perfect for any deck! 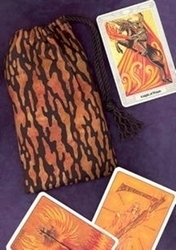 Shown with the bag are two cards from Davide Corsi's The Pictorial Key Tarot. 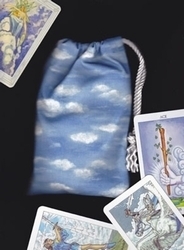 With this bag we also love the Epic Tarot, the Fantastical Creatures Tarot, and the Morgan-Greer Tarot. Size: Measures approx 5" by 7-3/4" to 8" inches (just under 13 cm x 20 cm). Fits most standard tarot card decks (3" x 5" or smaller).